January was an odd month in terms of our brand spanking new blog schedule (which you’ll notice, has already morphed into Saturdays instead of Fridays). On the other side of the words, I’ve been working on a project I’m really excited about and I’ve started work full time. Those two things haven’t quite figured out how to play nice yet but the hour long lunches are helping. There’s a hint about my project a little further down the post, but if you’re interested in helping me out I’m looking for some testers. Anyway, much more on that later – lets get on with the tasty goodness for this month. SIGGRAPH is Returning to Vancouver! SIGGRAPH (short for Special Interest Group on GRAPHics and Interactive Techniques) is the name of the annual conference on computer graphics (CG) convened by the ACM SIGGRAPH organization. The first SIGGRAPH conference was in 1974. The conference is attended by tens of thousands of computer professionals. Past SIGGRAPH conferences have been held in Los Angeles, Dallas, New Orleans, Boston and elsewhere across the United States. It’s basically one of the biggest graphics conferences in the world. Last time it was held in Vancouver and broke its prior conference attendance records. I love Vancouver and its close to a lot of my friends; if I’d known about it a little earlier last time I’d have saved and gone. I couldn’t be happier that they’re returning in 2013 – saving as we speak. Is anyone else planning to attend? Escape Studios are holding a webinar on the 15th February called ‘The Industry’s Best Kept Secret: Houdini‘. If you were around for my take on skills needed by a VFX Artist then little bells should be ringing all around your brain right now. Houdini has been on VFX the scene for quite some time, but over the last few years it has benefitted from somewhat of a revival. The product is renowned for combining superior performance and ease-of-use to deliver a powerful and accessible 3D animation experience for CG professionals around the world. In this webinar, Mark Spevick, our VFX tutor, will explain why it’s become a piece of software which is near impossible to live without and will dispel some myths about it being difficult to use. Mark will walk you through some definitive steps to help you get to grips with the software so you can start integrating it successfully into your workflow. As an integral piece of industry standard software, which all artists need to be in the know about, this is a webinar you don’t want to miss. I think that pretty much speaks for itself! The webinar is free, if you have the time I’d recommend signing up and attending. This may or may not be the project I referred to briefly in the introduction. Unless you’ve been happily living under a rock, you’ll have heard of SOPA over the last few months. This tweet is referring to The Oatmeal’s recent news coverage thanks to his efforts campaigning against it. Quick look at letters of intent from the editors point of view – useful and insightful. A skill we should probably all have as graphics professionals, especially important for texture artists. Deceptively simple as far as tweets go. FreelanceSwitch talks about how we’re not really our job titles in the eyes of our customers and how we can take advantage of this. Guest post granting insight into the use of auditory illusions and computer graphics with some speculation on how those techniques could be used in the future. Mehdi Shay shows us how to use alpha maps to create realistic foliage without spending hours modelling. Theory posts on (you guessed it) Deliberate Practice for VFX artists written by yours truly. They show off a bunch of research I did on job postings interpreted into something we can work with. Guest post overview of what it takes to become a 3D animator. Not sure I’d call it exhaustive but its a good starting point. Theory: Building Change into Your Workflow. What do you do when you’re almost finished a scene, and suddenly you need to change something? Does it throw off your entire workflow or have you prepared for such eventualities? Tutorial: Modelling or Unwrapping Small Accessories. I haven’t decided which yet, if you’ve a preference let me know (and I’m happy to do both). I received a copy not long ago in a Giveaway and since mobile seems to be increasingly relevant for everybody – Why not? Leave a comment to let me know what you thought of this style of post, and which ONE part you found most interesting. This entry was posted in Uncategorized and tagged Community, General, Inspiration, Monthly Review on February 4, 2012 by Heather Craik. This week’s been a little weird on the blogging front. On Friday I accepted a full time position with a local fundraising company (excited!) – I start on Tuesday. Therefore I’m back to juggling time a little more with writing and so on, definitely not complaining but you’ve all been warned. I also discovered some really interesting industry news (Twitter followers will be nodding along at this point, I’ve actually been using my account this week), I’ll be talking about two of the best pieces today. Keen eyed observers may have noticed that there wasn’t a feature post this week. Rather than making things awkward between us and mumbling for a few minutes with some excuses (which are good) and an apology (implied, sorry folks) let’s just skip to what I’m going to do to get things back on track. Tomorrow (the next Monday) I’ll be posting last Monday’s feature post on the Two Types of Purpose. Then on Friday I’ll be posting the one that should have been posted tomorrow; you’re getting two this week to compensate. My bad. On Wednesday we also had our first video tutorial (How to Animate a Dodgeball Throw) by Prantic, and the continuation of Jonathan’s 3D 101 series (3D 101 Rendering Fundamentals). Skyrill, a creative company run by the Almossawi brothers (Ali and Hussain), recently released a font set. This particular font set was created by modelling basic 3D letters in 3D studio Max, then using Realflow to give each the consistency of paint. They were then released from their shape constraints and left to explode; each frame was rendered and the most distressed, best looking, and easily recognisable images were chosen to represent the letter. When I first saw how the letters were constructed and destroyed I was split neatly in two with both halves suitably impressed. The first half was quietly in awe (that happens to be the same half that gets distracted by shiny, pretty things. Also destruction and explosions) while the second simply wished I’d thought of it first. Either way I’ll probably spend the next year looking for an excuse to do something similar. If you’re a gamer you’ve heard, if you’re a fan you’re drooling, and if neither you should go and watch the cinematic trailer for Diablo 3 right now. I’ll wait. Back? Excited? Excellent, I’m there with you. No concrete release date as yet but I did find something on Blizzard’s site that made it incredibly hard to sit still. As you might know there are 5 character classes in this installment; barbarian, witch doctor, wizard, monk, and demon hunter. Perhaps predictably I was drawn to the hunter. Click on that beautiful image below and watch the class trailer to see why. Next week you’ll be treated to two heavy-duty concept posts as well as the Clipping Frames in Photoshop tutorial with James and the next installment of Jonathan’s 3D 101 series. As always I can’t vouch for next weekend’s post; after my first week at a new day job I may be a little loopy (as if I’m not already) so there’s no telling what I’ll come up with. We’ll have to see. In the meantime though comment and let me know what you think of this week’s highlights! This entry was posted in Uncategorized and tagged Community, Games, Inspiration, Weekend on July 17, 2011 by Heather Craik. Small Favour – Project Survey Time! Post is sitting half-written in drafts as we speak, honest. Though in the meantime if you could answer this survey I’d be endlessly grateful! It’s to do with the project I’m working on in college, proper introductions etc on Friday. This entry was posted in Uncategorized and tagged General, Inspiration, Technology on March 3, 2011 by Heather Craik. From famous glass-blowers to someone that can loosely be described as a light artist. In this post we’ll be looking at a completely different style of creation and what we can learn from the spirit behind it. Last week we looked at how changing the parameters of a craft can turn it into an art form, this week we’re looking at how science and research can enable our work. 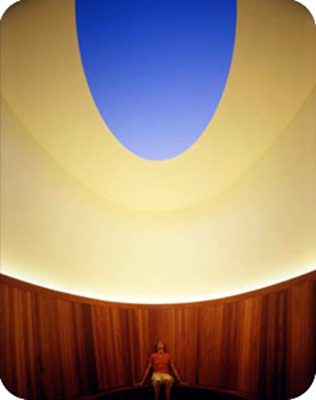 Turrell came to art in a more round-about fashion that most; he was a student of psychology and mathematics, an approach that’s carried across into his work since. He never sculpted or created paintings, instead he’s been using light installations to evoke emotions in his viewers on a more basic level. He believes that by using light in certain ways you can create a space in the mind to start exploring your own sense of spirituality. The Roden Crater in Northern Arizona houses his largest experiment. Using the natural light he’s created different rooms in the crater in order to control how the light is perceived, with the ultimate aim being to make people feel different, powerful emotions within each one. According to James, light, our understanding of it, and its effects on us are key to how we perceive the world. I’ll be the first to say that he wasn’t an obvious choice as a role model for me personally. Looking at his art online you don’t really get a feel for what he’s trying to achieve; it was only after seeing how people viewing the rooms in person reacted that I became more interested. Using art as a way to help people connect to themselves and the world around them is, I think, one of the things that defines great art. If art is a conversation, then art that can connect and prompt thoughts and emotions is doing something right. “I always felt that art was more interested in posing the question than it was in getting the answer, but I’ve come to more recently think that art is the answer.” James Turrell, interview with Egg. There’s two things I’m choosing to take from Turrell’s approach. The first is that science and more technical skills don’t have to be separate from art and creativity – in fact, they’re more linked than not! Using what we’ve learned through research and ‘techie’ skills we can have greater freedom to create something wonderful. The second is that art must have a purpose and a meaning. Well, I guess it’s possible to have ‘art’ without either of those things being intentional… Looking at the great artists of the past and present though, are there any that didn’t have something to say? New thoughts, new ideas, new twists, perspectives, conversations – aren’t those more important than any creative or technical ability? How can we use this? I propose that as a community we should be moving towards expressing ideas and truths, without restricting ourselves to purely technical or purely artistic methods. Programmers can create incredibly beautiful things using some lines of code. Artists can do the same using some lines on paper. The means don’t matter. However one question to ask yourself before creating, or maybe even after (if you’re the sort of person that likes to just pick up your things and start), is important. This entry was posted in Inspiration and tagged Colour, Inspiration, Life, Lighting on November 30, 2010 by Heather Craik. Every profession has its heroes, and every individual in a profession has people they take inspiration from. This is particularly important in ‘creative’ industries, though you’ll see it happening across the board. The more aware you are of your preferences and role models the easier it’ll be to climb out of a slump when you need to. Since I’m just starting to explore this myself, over the next few months we’ll be having a look at three artists whose work really resonates with me. We’ll also look at how you can utilise your own heroes to launch yourself further towards your goals. Dale Chihuly’s art takes the form of beautiful glass sculptures and installations, each exploring colour and form in new and natural ways. He was one of the first glass-blowers to take the step from solitary work to building teams in order to create something larger and more intricate. After studying architecture, he became fascinated with blown glass in the early to mid 1960s and has been furthering the craft/artform ever since with his installations, research, and innovations. A lot of his influences come from his past; his mother’s gardens in Tacoma, his childhood, and his love of the sea. When he first started out there was a huge amount of respect for his medium, which enabled him to learn from established professionals and study in the first hot glass program in the US (University of Wisconsin). The reason I find Chihuly’s work so interesting has a lot to do with my obsession with colour and contrast; through his experiments with glass he’s discovered new ways to tie his art into his environment. Man made and natural. Also he plays with light and dark a lot, especially in his later pieces (the Black Series in particular deals with setting the scene with darkness to show off the brighter colours and light). Added to that is the fact that, as a person, he’s pushing the boundaries of what’s ‘acceptable’ and ‘normal’ all the time. Through building such strong teams and creating such large pieces in glass he’s challenging the old stereotypes surrounding his medium. Once thought of as a solitary craft, he’s shown us that it can be a collaborative art. He’s doing what he loves because he loves it without worrying what anyone else will think. I’m not a glass-blower. I do like to create, and contrasts in life, emotion, what we see, what we hear, and so on… Delight me. I also like to be reminded that creating doesn’t have to be a solitary act. Therefore summing up Dale Chihuly’s influence on me isn’t difficult. By looking at his work I can see how someone else has tackled contrast in a literal sense, and from that I can start to notice subtler distinctions in my own work. Having recognised that it’s such a huge theme for me, I’m now a lot happier to explore the bounds of that theme (and ignore them entirely when I choose). Most important of all (perhaps) is seeing someone succeed at creating/working on something they love. Who wouldn’t want that for themselves? Take a look at your heroes; Who are you drawn to? What do you like? When I first did this exercise every artist I was fond of happened to be a digital fantasy artist. Looking through them I eventually realised that they all had certain themes and focuses in common… one of those is contrast. After identifying that I looked for artists in different areas using those themes. Dale Chihuly was one of the first I came across and fell in love with (artwork, come on people). Now I like the ‘new’ artists I found more than the older ones! Give it a go, you might be surprised what you learn (I sure was). Oh, and comment here too – who do you look up to in your field and why? This entry was posted in Inspiration and tagged Colour, Inspiration, Life, Lighting, Role Model on November 15, 2010 by Heather Craik.